Have you ever wondered why spirits trap themselves in the cold, gray world of the Ghost Realm? Of course you have! Well, wonder no more! In one of the few ghost books of its kind, you’ll not only be reading the ghosts’ stories, you’ll also be taken behind the scenes to where the real action takes place. In this book, professional psychic medium Boo Newell takes you on a journey shared with an assortment of ghosts, from murderers to betrayed lovers to steadfast soldiers. You’ll hear directly from the “ghosts’ mouths” what issue or issues they carried with them to the grave—the issues that prevented them from going Home to the Other Side. How did they resolve these issues to find peace . . . or did they? Through her abilities as a psychic medium, Boo connected with these lost, troubled spirits to help them understand and face the issues that trapped them in the Ghost Realm. 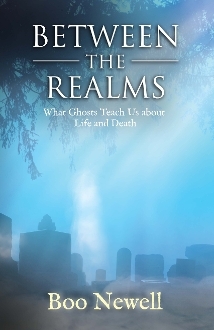 Throughout the book, she not only tells the ghosts’ stories, but also shares with the reader many interesting, insightful facts about ghosts, how to work with them, how to do clearings, and how to lead paranormal investigations.